Dominant TF: 60 mins & Daily (15mins time frames too). Weekly influence declining. 60mins: Congestion to mildly down, but probably at a slow pace. We've had a bit of a bounce, which could technically reach PR1 close to 830, but MTFS (AdStoK) is giving a pattern that is more indicative of a trading range so it may not get there any time soon. On the down side, the same support levels are valid: 820 then 813 later on. Daily: Down, til support is found. MTFS (formerly AdStoK) is weaker, lines have crossed, bars are red, all indicating a definite slowdown. We could certainly look for support between 808 (Fib) and 812 (MM) in the next few days. 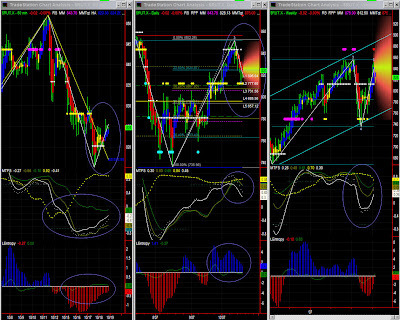 Significance level is lower, but the overall "U shape" MTFS pattern is still there, and strong MM resistance remains 875. 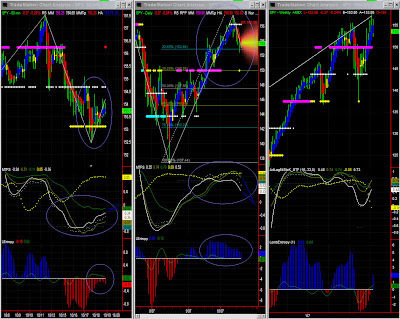 One must check significance level (divergence) which could invalidate the pattern. 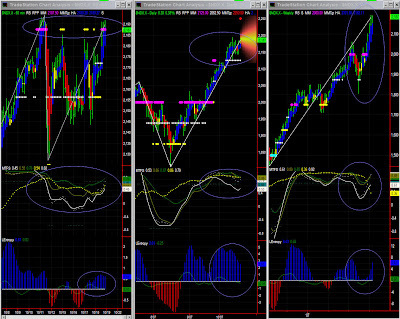 Lower time frames will soon provide us with clues (support level and return to the dominant trend). Market direction: Probable Congestion. Watch 2188 key level, particularly on 15mins chart, for clues on forthcoming direction. Note: A variation to the MTFS (or AdStoK) white line is plotted (test). It provides a slightly higher memory effect in the indicator. 60mins: Congestion with some remaining upward bias. As said yesterday, we've had a continuation of the upward bias within a [2156-2188] trading range, and we now reached the high end of that range. The pattern is completed and it is more difficult to gauge what is coming next. Behaviour around this level will determine forthcoming direction, and lower time frames do provide higher significance level and trading opportunities. MTFS and Entropy are now showing more signs of weakness. There is however still substantial accumulated energy in Entropy that one cannot imagine a serious retracement right now, but one could certainly have a pause with some congestion and profit taking (same [2150-2200]range). One cannot discard a development of a new pattern which in this high volatility environment could take just a few days to materialize. Note: the new MTFS (AdStoK) White Line variation is higher, hence down-plays the effect of the current profit taking event.